we gave our daughter her own instagram account for her 14th birthday. but first, we made her agree to a few things. we made her sign a contract. and yeah, we used scripture to back up our expectations. my husband and i drew up a social media contract for her, specific to instagram since that is the only platform she is using. and because the Bible is the foundation of our family's moral compass, we added scripture into the contract as a reminder of who she is and Whose she is. in a world full of puppy ears and sparkle eyes filters, we want her to know that the best filter she'll ever use is the Word of God. this contract was written with our teenage daughter in mind, but honestly i wish everyone had to agree to these things before they got online. social media would be a much nicer place! as a social media marketer/online influencer manager, i understand what she's getting into. being on social media is a bigger deal than it might seem. it's a big responsibility and privilege that we don't take lightly. this isn't just about posting selfies and seeing silly memes. she will be exposed to a lot. there will be temptations and influences. she'll have new opportunities to walk the walk we've taught her to walk. when my daughter is online, i want her to represent our family well and i want her to represent Jesus well. we've raised her to know that her identity is found in Christ alone, not in likes and comments. we've taught her that words are powerful and to use them wisely. she knows how to trust the Holy Spirit for discernment. she knows to prepare her heart before she posts. it's less about what to post and more about why she's posting. we have taught her, and will continue to instill, that what really matters in life is Who she follows (Jesus), not who follows her on instagram. something i'm learning as i go is that the best way i can protect my kids is to prepare my kids. the natural instinct is to protect them by preventing them from doing anything - the put them in a bubble perspective. but that isn't really living at all. a safe life isn't an abundant life, because a safe life never learns to dream big, take risks, try new things, or trust God fully. we're called to train our children in the way they should go, which means we need to prepare them and equip them for an abundant life, fully trusting God and leaning on Him. 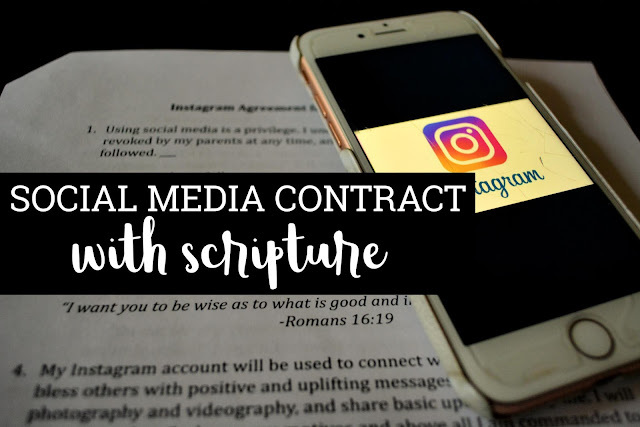 so, instead of keeping my kids off of social media and strictly prohibiting it for their entire lives, we are choosing to equip them with biblical boundaries and guidelines that line up with our family's beliefs. a line of communication has been established now, and how we navigate being on the internet will be an ongoing conversation with lots of grace and love, remaining firm in our foundation. 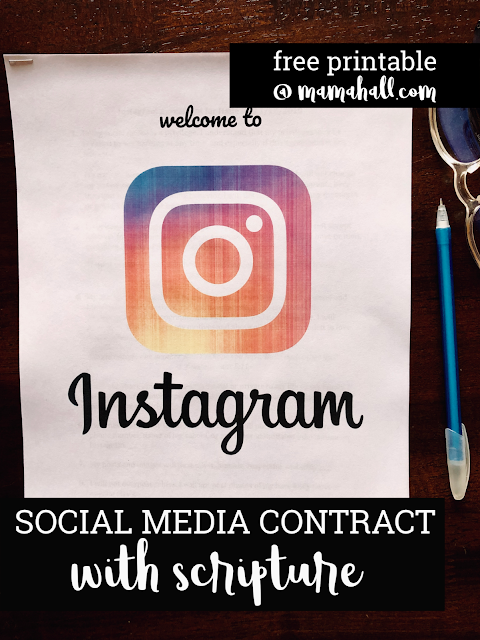 this social media contract is where we're starting. social media is supposed to be a fun place to connect with friends. that's it! 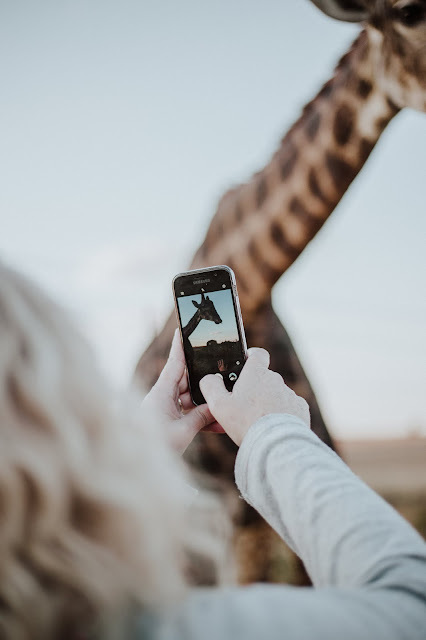 these boundaries are in place not to be a helicopter parent or to take social media too seriously, but to keep it fun and safe. share your thoughts with me on instagram (of course)!